As is often the case with ICEL translations, there is a pretty serious error here. The Latin does not say that the tears of St. Monica moved God, but rather that God received the tears of St. Monica and converted her son (lacrimas beatae Monicae suscepisti). However, while the grammatical blunder is certainly inexcusable, there is no need to think that the English translation of the prayer is doctrinally unsound. The Gospel reading at Mass today is the story of the conversion of Nathanael in John 1:45-51. It may at first seem odd to us that, on the feast of the apostle Bartholomew, we would read of the conversion of Nathanael. Why not hear the conversion of the apostle? In fact, St. Bartholomew is Nathanael! Bartholomew is his last name, while Nathanael is his first name. 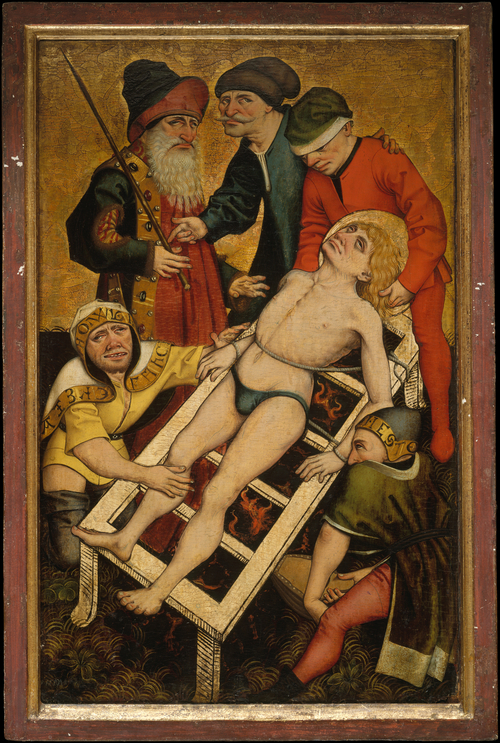 Thus, the conversion of Nathanael is indeed the conversion of Bartholomew. Don’t be too disappointed if you didn’t realize this, however, because even the great St. Augustine had difficulty in understanding this point! The greatest work of theology, after the Summa Theologiae of St. Thomas Aquinas, is often considered to be the Tractates on the Gospel of St. John by St. Augustine. In this collection of sermons, St. Augustine comments on the whole of the fourth Gospel in great detail – sometimes even considering the sacred text word for word. However, as brilliant as St. Augustine was, he occasionally misses important aspects of the Gospel account. Nevertheless, as we will soon see, even when the Doctor of Grace is wrong about some particular point, he is ingeniously right in interpretation of the passage as a whole – in this respect he foreshadows St. Thomas Aquinas who is more brilliant in his error than all the other doctors have ever been in their best moments (consider, for example, his teaching on the Immaculate Conception; though he denies the doctrine, he provides the Church with nearly all the theoretical framework that she would eventually use in the proclamation of the dogma). After the master of the house has arisen and locked the door, then will you stand outside knocking and saying, ‘Lord, open the door for us.’ He will say to you in reply, ‘I do not know where you are from. […] Depart from me, all you evildoers! With these words, Christ reveals to us the eternity of hell – there will be no forgiveness after death for the sinner who has died in unrepentant mortal sin. No plea for mercy will then be heard and none will come to the aid of the damned, but their punishment will last for all eternity and there will be no end to their misery. What is it that makes hell to be eternal? Is it God’s justice? Does God deny the damned the grace necessary for repentance? Are the wicked so abstinent as to refuse God’s grace? We shall see that the human soul, after death, becomes immutably fixed on either good or evil, such that no change of course is possible – not even God could bring a soul out of hell, there no grace is efficacious! Today, it is the common opinion of the affluent countries of the west, that all (or nearly all) people will be saved. This view is, however, contrary to the estimation of the holy Fathers and Doctors of the Church. Moreover, Christ himself tells us that only a few will be saved. Many will attempt to enter the gates of heaven, but will not. The way to heaven is narrow and few find it (cf. Mt 7:13-14). These words are difficult for the modern world to accept, precisely because the modern world refuses to admit the reality and gravity of sin. If there is no real sin (and no serious sin), then clearly there is no hell. But if sin is real and can be serious, then it can also be mortal, killing the soul by destroying charity, incurring the punishment of eternal damnation. 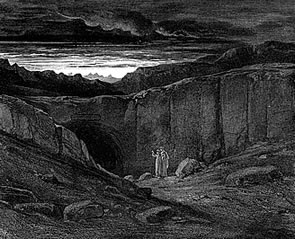 And so, we may begin our study of this Sunday’s gospel by looking for something of an answer to the question, “Will only a few be saved?” Or, “How many will be saved?” In a later post, we will consider what it is that makes hell to be eternal. 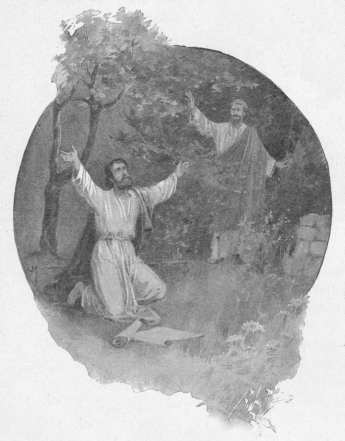 Today’s gospel parable of the landowner and the workers in his vineyard (Mtt 20:1-16) reminds us of an essential equality which is present in heaven: Just as all those who worked in the vineyard (from the first who worked all day, to the last who worked only one hour) received an equal payment, so too, all those who die in Christ’s grace receive the reward of heaven. There is a certain equality about this reward, since all who are in heaven enjoy perfect happiness. 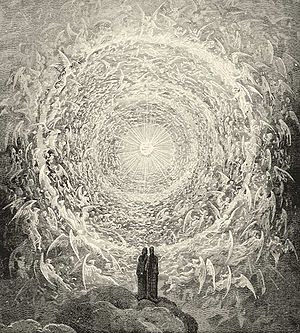 However, the feast of the Assumption, celebrated this past Sunday, reminds us of a degree of inequality in heaven as well. For the Blessed Virgin Mary is exalted over all the angels and saints to a higher place of blessedness and honor – she is Queen over all creation. 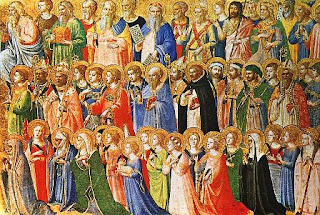 Thus, there are levels of glory bestowed upon the saints, some are raised to high place and others are raised even higher. 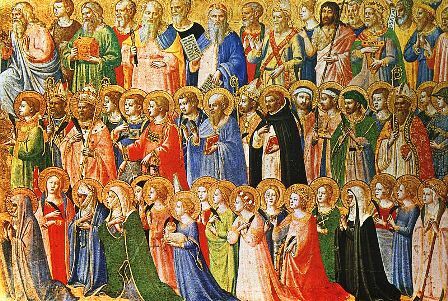 At the highest height stands the Virgin Mary; it is likely that St. Joseph comes next, or perhaps the greater angels, then the many saints of the Church together with the angles of God. Where was Mary assumed to? We must be very clear on this point: The Assumption is not a metaphor. 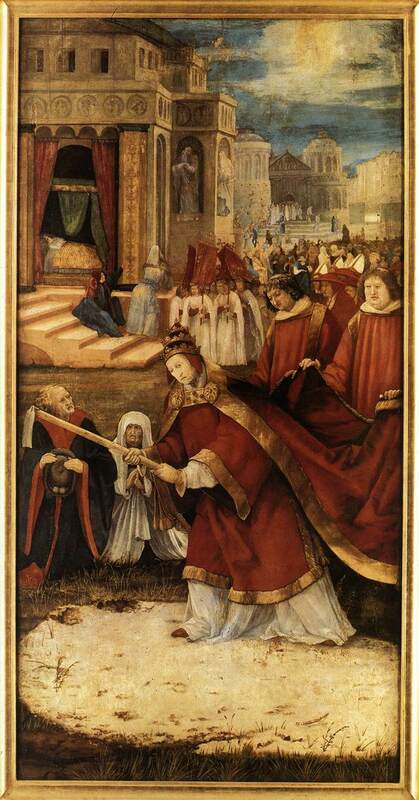 The Blessed Virgin Mary was really taken up, her physical body was transformed. Pope Pius XII in Munificentissimus Deus (1950) declared that Mary, “after the completion of her earthly life, was assumed body and soul into the glory of heaven.” Both BODY and SOUL! This means that her physical body was transformed and glorified (in a manner identical to Christ’s after his Resurrection), her soul was perfected with the Beatific Vision, and she was taken up. 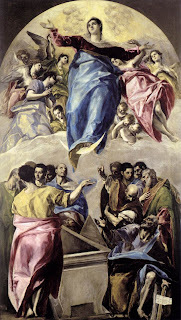 In the General Audience of 21 July 1999, Pope John Paul II stated that heaven “is neither an abstraction nor a physical place in the clouds, but a living, personal relationship with the Holy Trinity.” In this statement, as (almost) always, the great Holy Father was in perfect accord with St. Thomas Aquinas – “Incorporeal things are not in place after a manner known and familiar to us, in which way we say that bodies are properly in place; but they are in place after a manner befitting spiritual substances, a manner that cannot be fully manifest to us” (ST Supplement, q.69, a.1, ad 1). Some in the early Church considered the thief to be Satan. 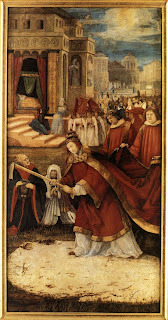 Thus St. Hilary says that the parable of the thief “shows that the devil is very watchful to take from us our goods, and to plot against the houses of our souls, that he may dig through them whilst we are careless, and given up to the sleep of our own devices; and he would pierce through them with the darts of enticements. It behooves us, therefore, to be prepared, because ignorance of the day sharpens the intense solicitude of expectation ever suspended.” However, this does not seem to coincide with what follows, since our Savior compares his coming to that of the thief. Therefore, it is better to say that the thief is a metaphor for Christ in his coming. Was the Transfiguration a miracle? 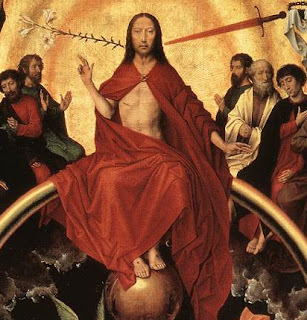 In the Transfiguration, the glory of the beatific vision (which Christ possessed in his soul since his conception) overflowed into Our Savior’s body not as an immanent quality but after the manner of a transient passion – in other words, the change was only temporary. Moreover, the glory shone in Christ’s body only according to the quality of “clarity” or “brightness” and not according to the other qualities (e.g. subtlety, agility, etc.). This overflowing of glory was a foretaste of the Resurrection and was miraculous, since the glory of the Resurrection was to be merited by the Cross and it was only by a special divine dispensation that this glory should be experienced in part at the Transfiguration. 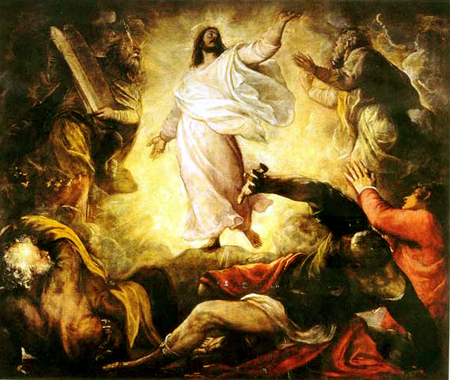 Thus, the Transfiguration is properly a miracle as a clarity was given to the body of Christ in a most extraordinary manner before his glorification (ST III, q. 45, a. 2). Today, the Feast of the Dedication of St. Mary Major (Our Lady of the Snows), we honor the Blessed Virgin Mary in a particular way under the title “The Mother of God” or “Theotokos”. This term, which has spread throughout the world and is particularly central to the “Hail Mary” prayer, was once a point of great debate in the Church. While all accepted that Mary was the Mother of Jesus and the Mother of Christ, some felt that the Church went too far in calling her the Mother of God. 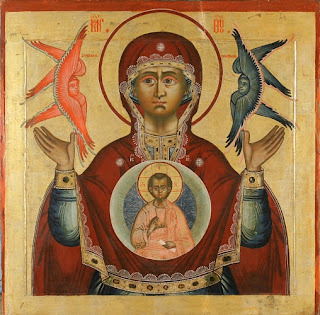 If we compare this title to another which might at first seem identical – “The Mother of Divinity” – we will quickly understand the theological significance of Mary’s motherhood and the proper meaning of her most cherished title, “Mother of God”. 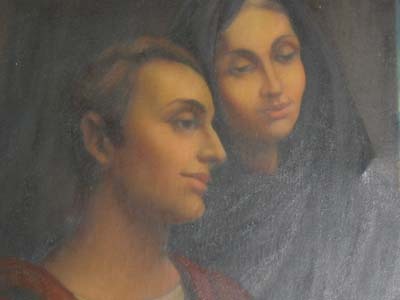 “Under the pontificate of Liberius, John, a Roman patrician, and his wife, who was of an equally noble race, having no children to whom they might leave their estates, vowed their whole fortune to the Blessed Virgin Mother of God, begging her most earnestly and continually to make known to them by some means in what pious work she wished them to employ the money. The Blessed Virgin Mary graciously heard their heartfelt prayers and vows, and answered them by a miracle. “On the Nones of August, usually the hottest time of the year in Rome, a part of the Esquiline Hill was covered with snow during the night. That same night the Mother of God appeared in a dream to John and his wife separately, and told them to build a church on the spot they should find covered with snow, and to dedicate it to the Virgin Mary; for it was in this manner that she wished to become their heiress. John related this to Pope Liberius, who said he had dreamt the same thing. August is the month traditionally dedicated to the Immaculate Heart of Mary. 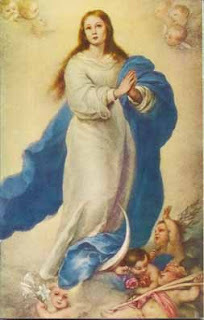 In fact, the old feast of the Immaculate Heart is August 22 (which is still celebrated as such, by way of indult, by the Missionaries of Charity as their patronal feast). As we honor Our Lady's Immaculate Heart in this month of her Assumption, we do well to venerate her spotless virginity, which, as an ancient synod of the Roman Church put it, is to be affirmed ante partum, in partu, and post partum. We all know well what it meant for Our Blessed Mother to be ever-virgin before and after Jesus's birth, but few Catholics know that we believe by Catholic faith that Mary was a virgin even in giving birth to Jesus. Ludwig Ott's explanation of this doctrine of the faith is helpful, as far as it goes. Ott gives perhaps too much quarter to the 20th-century objections of Von Mitterer, Galot, et al. However, his treatment is historically sound and reveals the truth of the Marian virginitas in partu. For sheer beauty, however, nothing can match the lucid presentation of the Common Doctor.